Tungsten carbide rings are somewhat new in the wedding band and ring market. Tungsten rings are cheaper than gold or silver bands and provide the same quality. In fact, Tungsten Carbide is more resilient than silver, and it has a remarkable sheen. The metal tungsten is harvested from the ore of a Wolframite vein. Tungsten has the highest melting point of all pure metals; it can withstand temperatures of up to 6,100 degrees Fahrenheit. As with any pure metal, tungsten can become tarnished through erosion and other natural causes. On its own, tungsten can also scratch relatively easily. However, when combined with a carbon alloy, tungsten becomes tungsten carbide. Tungsten carbide has a hardness between 8.5 and 9.5 on the Mohs scale. This makes tungsten carbide about two times harder than steel, and four times harder than titanium. This level of hardness makes tungsten carbide nearly impervious to scratches. It is for this reason that tungsten carbide was used in extreme applications before its introduction as a wedding ring material. For instance, tungsten carbide is still used in rocket engines. Tungsten carbide is also used in the mining industry, specifically for the cutting end of equipment. Not only is tungsten carbide extremely durable, but it is also naturally beautiful. Tungsten carbide has some of the same aesthetic values of silver. The shine is about the same, however, tungsten carbide will retain that shine for a lifetime, and silver will not. When polished, tungsten carbide will reflect much more that silver, making it look much more appealing in the light. Furthermore, tungsten carbide will look brand new once re-polished. The chemicals used to polish the tungsten carbide will wear off in time, but after another application, the ring will look brand new. Other metals tend to look lackluster after being re-polished. This is because the bonds between the metal and the chemicals aren’t as strong as they are in tungsten carbide. Most tungsten carbide rings are bonded by nickel or cobalt alloy. Cobalt alloy will make for a cheaper ring, but the bond between tungsten and carbon won’t be as strong. This can cause faster wear, so that the ring requires more frequent polishing. The bonds formed with a nickel alloy make the ring more durable, and allows for a longer lasting shine after polishing. As with most other wedding rings, tungsten carbide rings are made to be custom fit. Not only are these rings durable, but they are also more comfortable than most rings. Tungsten carbide causes little friction with the skin, making it almost unnoticeable. Gold and silver inlays provide a beautiful contrast with the amazing sheen of tungsten carbide. Platinum engravings, despite being silver in color, stand out wonderfully against the tungsten carbide. Tungsten rings and bands can also be adorned with gemstones, such as a birth stone, or diamonds. Are Tungsten Carbide Rings Indestructible? Tungsten carbide rings are almost guaranteed to remain unscratched for a lifetime. There are only two other materials that could cause abrasions: corundum and diamonds. While tungsten carbide is extremely resistant to scratching, it isn’t impervious to other damages. Tungsten carbide is more brittle than other conventional band and ring metals. This means that the bonds that hold the tungsten and carbide aren’t as strong as a pure metal band, such as gold. Since the two metals are combined, rather than shaped from one element, there is the risk that the ring could chip, or break. This, however, is still highly unlikely. In any event, most ring and band dealers will offer lifetime warranties with their rings. Most dealers do this because there is little to no chance that any one ring will incur damages. In the event that a medical situation occurs where the ring needs to be cut off or broken the tungsten carbide ring will prove to be the easiest to get off. Unlike other pure metal rings, tungsten carbide will break, or shatter, under heavy pressure. Pure metal rings will bend and become deformed, often causing severe damage to the finger. If the tungsten ring incurs a lot of force from a falling object, then it will break harmlessly around the finger. While this may be a factor that slips some buyer’s minds, it is another advantage tungsten carbide rings have over their other metal counterparts. In terms of sizing and engraving, tungsten rings are at a disadvantage when compared to the other metal bands and rings. Do to its extreme hardness, tungsten cannot be reshaped after the initial forging process. This means that great care must be taken when determining your ring size. Engravings on tungsten carbide do not show clearly. This is because the coloration of the metal behind the polished surface looks much the same. Instead, it is suggested that you get a platinum or gold inlay. You can do this one of two ways, on your own, or at the jewelry store. Even if you are ordering your ring off of the Internet, it is still advised that you get your ring finger measured by a professional. The same ring sizing chart is used for both men and women. To accurately determine your ring size on your own, you will need to use a material that is no more than half an inch in width. Wrap the material around your finger so that it is just touching the skin. Mark this point with a pen or a pencil, and then unwrap the material. You can then measure the length of the material to the marked point, and then find that measurement a ring sizing chart. There are several ring size charts available on the Internet. Tungsten carbide wedding bands are often appealing to men. This is because they aren’t too over the top in terms of design, yet they have a sophistication and natural shine that is unparalleled. 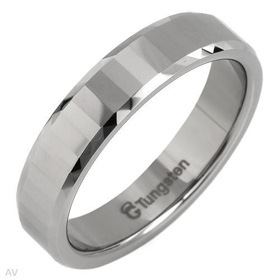 Tungsten carbide bands for men can also be made with multiple materials. This means that you can have a layer of gold between two outer layers of tungsten carbide. The contrast of such a ring is visually stunning and will be the cause of several compliments. These wedding bands can also be inlaid with other materials, such as a platinum engraving, or a black ceramic coating. One thing holds true for most styles of tungsten carbide wedding bands, and that is the simplicity in their design. This simplicity causes the true natural beauty of the metal to be the most eye catching, and tungsten carbide is the best material for this design feature. Most tungsten carbide rings for women are inlaid with diamonds. When looking for the most in terms of quality and durability, there is no equal to this ring. The tungsten carbide provides and excellent reflective backdrop for the diamonds, causing light to reflect brilliantly off of them. A tungsten carbide ring can be inlaid with several small diamonds for a simple sophisticated design, or they can be adorned with large diamonds that demand attention. Aesthetically, tungsten carbide provides the best material for supporting an inlay of diamonds. Tungsten carbide ring pricing depends on the design, but the basic band will cost about $100. When compared to a similar gold ring, which costs about $450, the price difference is very noticeable. The price jumps drastically when the tungsten carbide is inlaid with diamonds, with prices depending on the quantity, quality and size of the diamond(s). For a basic inlay, prices range between $400 and $700. This is still a far cry from inlaid gold rings, where prices can jump to as much as $2,000 for a basic inlay. Tungsten carbide rings, however, are slightly more expensive that titanium and silver rings. The basic titanium band will go for about $75, and silver for about $80. As with all of the ring materials, additional engravings and inlays will warrant higher price tags. Where Can I Obtain a Tungsten Carbide Ring? All of these stores have an online store that you can purchase their merchandise from. However, seeing the ring in person before you buy it can be a huge help. In addition to these retailers, there are also several online retailers that sell tungsten carbide rings. You can often find these rings at half price online, but these rings often do not come with a lifetime warranty, and you will have to pay a professional to fix any damages that the ring incurs. Is This the Right Ring for Me? After reviewing all of the information above, the choice is yours. Tungsten carbide rings are impervious to scratches, and provide eternal natural beauty at an economical cost. While they may be brittle when put under extreme pressure, this can be viewed as an advantage over other rings that may cause physical harm under such conditions. Due to the wide variety of customization options available for this ring, there is likely a tungsten carbide ring for everyone. Essentially, if you want simple, natural beauty, an economical price and a ring that will retain its characteristics for a lifetime, then look no further.